Derived from the aerospace program, this is the first and ONLY saddle pad that provides TOTAL PRESSURE MANAGEMENT. 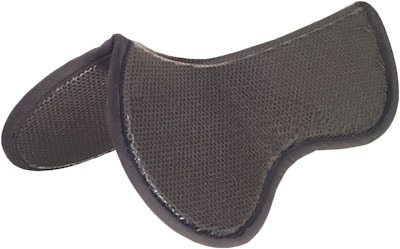 Provides pressure relief, reduces shearing, allows excellent ventilation to control heat and moisture - the key to preventing sore backs in horses. The honeycomb cells contour and flex with your horse's movements to absorb shock and prevent the saddle pad from slipping. Antibacterial. Antifungal. Easily cleaned by hosing off.